Embracing Cottage Style: Blog Party Time!! Hi Marcela! 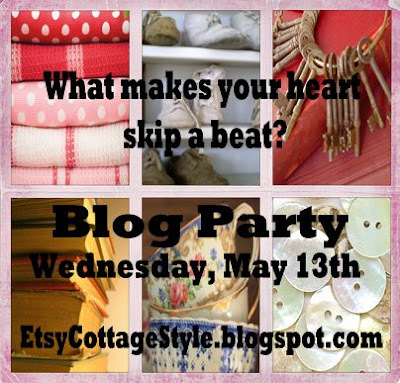 Thanks for having Etsy Cottage Style host another wonderful Blog Party... they really are so much fun! Love your images and post, of course ;o) I'll be back to see what everyone else shares too! I just love parties...don't you? Come on over to my house for minute won't you?? Hi Marcela, I love all your shabby, chippy things also. You always show such lovely treasures. Thanks so much for hosting these blog parties they are so much fun! I can't wait to take a look at all the other blogs. It's always so inspiring. And you are the Queen of inspiration!! How Fun! This will be my first blog party and I can't wait to see what everyone features! Thanks for hosting such a great gathering. Marcela, thanks for hosting this. It is a wonderful idea. I am so excited to find some new blogs and read from some old favorites. Your pictures are just beautiful. I love anything old and chippy, too! Thanks for hosting the party! I'm working on a post but I have to leave for work in a few minutes... I'll try to finish up when I get back. Have fun while I'm gone! I love your addictions!! Great blog parties! Have a great day! Marcella, great blog party! 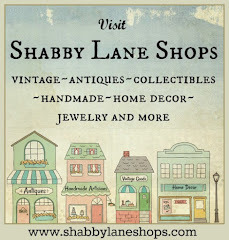 Love your shabby chic, chippy collection! Have a great Wed.
well... my english is not so good to tell all i would like to say, but i hope you can imagine what i mean with my photos! thank you Marcela for inviting to your party, and thank you all for sharing all those marvellous posts!!! kisses. I just got home from work & finished my blog entry! Come by for a visit! Marcela, this has been fun! What a fun party! Hahaha I totally misunderstood and thought it was a chat. I don't have time to post today but popped over for a quick hello! leave this up and I will add mine tomorrow! Hope everything is great! Love all your chippy stuff!! Oh darn! I just saw this and was gonna sign up...but its already over.....Awwww man!!! The blog party sounds like fun. All of your photos here excite me. I love shabby chic and country. I had country in my house in CA but since moving to OR I have changed to a more elegant look. I am thinking of going shabby chic in the near future. Victorian things are what inspire me most. Thanks for having this party. I am looking forward to it. How fun! Love chippy too Marcela! I posted this party on my new blog. Off to visit all of yours! What a fun idea. thank you!